Loftmar has an established reputation as an excellent teaching barn. Lessons are taught to riders of all ages and levels of proficiency. Competent, certified instructors teach in private, semi-private or group formats. Lesson Structure: It is important that you are on time and ready for your lesson. Using Loftmar's clock, lessons start on the half-hour or hour with five minutes allowed at the end of each lesson for the instructor to check on students preparing for the following lesson or to schedule make-ups. Half-hour: If you are a beginner student taking 1/2 hr private lessons, grooming and tacking are included in your lesson time until you are able to join a group. Group: Students must be present 10 minutes before their group lesson starts to groom and tack assigned horse. You should be in the ring, with your stirrups adjusted, girth snug, and ready to mount within ten minutes of the scheduled lesson start time. If you are late, it is not fair to the others in your group. Evaluation: All new students must complete a 1/2 hour private evaluation at a cost of $ 45. At this time, you will have the opportunity to meet a member of our instructional staff who will personally show you the facility, our horses, answer your questions and advise you of available lessons appropriate for your skill level. Lesson Cancellations: If 24 hr. notice for group, or 48 hr. notice for private is given, the lesson may be made up by riding in another scheduled lesson time. As long as you are a participating student with Loftmar Stables, you will have 3 months to do make up or lesson is forfeited. During the last part of your scheduled lesson time, while horses are being cooled down and put away, is the best time for discussions with instructors and scheduling of make-up lessons. Group make-ups may not be used toward 1/2 hr. private lessons. You may not apply make-ups to your regularly scheduled lessons. 1/2 hr. semi-private lessons must be made up in a group lesson. Lessons are rarely canceled and you will be contacted if they are. Riding Attire: Most important is your riding helmet. We do have some available but, you should purchase your own. SEI/ASTM approved helmets are required. After riding for two months, we require students to have their own riding helmet. After two months - if a student, does not have their own helmet, there will be a $5 per use rental fee for Loftmar helmets. Hard sole shoes with a small heel (to help stop foot from sliding through stirrup) or riding boots should be worn. Cowboy boots are not recommended due to the angle of the arch and boot heel. While riding breeches are comfortable, stretch pants will suffice, many students also ride in chaps. Rider should be neat in appearance, shirt neatly tucked in, hair properly up or tied back. Purchasing Riding Attire: For new apparel and riding equipment visit Dover Saddlery in Crofton, MD, 410-451-2174. Used apparel and equipment can be bought at MD Saddlery Consignment Shop in Gambrills, MD, 443-292-4684. Paddock boot or "Granny" boot styles are very popular and can often be found inexpensively at local discount retailers. Lesson Preparation: Proper grooming of the horse is essential to the horse's health, happiness, comfort and will encourage communication between horse and rider. Check Horse Information Sheet on bulletin board for special requirements for your assigned horse. Be organized-have helmet, grooming equipment and tack ready before getting your horse. If you are tacking in a stall, bridle 1st, saddle 2nd. If in cross-ties, saddle 1st, bridle 2nd. When tacking, tighten your girth gently, re-tighten before you mount, and then tighten a final time after walking your horse. Students must also cool out their horse and put their equipment away after lesson. We encourage team work. If your horse is being used in the lesson before yours, then help someone else in your lesson get ready. We strongly discourage parents from helping the children because they may rely on their parents assistance too much and will not learn as quickly. 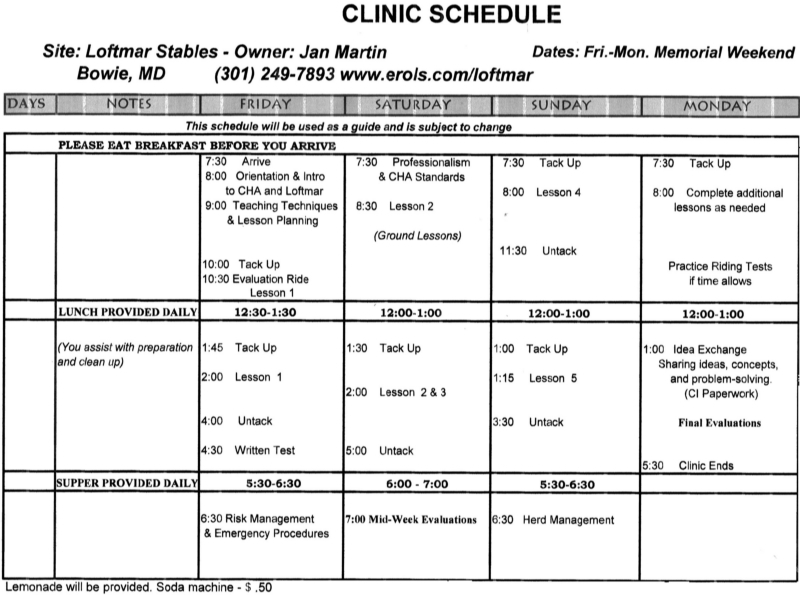 Certified Horsemanship Association (CHA) Riding Instructor Certification: Loftmar sponsors CHA Riding Instructor Certification clinics under the auspices of The Association for Horsemanship Safety and Education. There will be no riding during the second full week in Feb., Apr., Jun., Aug., Oct., and Dec. Lessons will be devoted to the CHA curriculum. This will allow our horses to have a well earned break and permit you to review the CHA material and work towards certificates and badges. For more information on attaining CHA certification as a riding instructor go here. A flyer describing on our next CHA Riding Instructor Certification can be found here; an application can be downloaded here. See the schedule for our next session here.